From the cruise ship dock walk toward town go over the overpass to lower level go to the beach side. Looking back out to the cruise ship go right along the white wall to about the second or third opening down to the beach area. There are steps that go down to the beach at low tide you have to jump down to beach. I found more than 20 pieces per hour. Take a cup or small plastic bag. 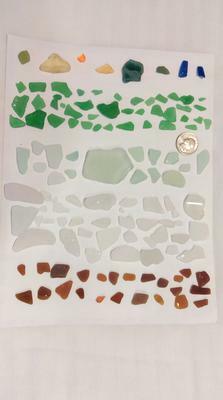 Great greens, browns and white sea glass. Well rounded edges and frosted. Is that little piece, near the center, top row an orange piece? Than for this exciting information!